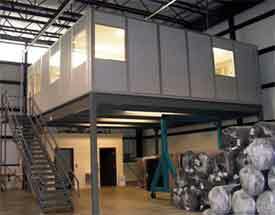 Modular Prefabricated Building Construction Sales & Installation Nationwide. Unlike traditional building methods, which are hugely intrusive, and labor intensive, modular building construction has a lot of advantages that can save you a great deal of time and money over the period of the building, and minimize the impact that construction work has on your business. The most important aspect of modular building construction is that the vast majority of the work is carried out off site. The various components of the building are assembled in the factory, where all the power systems, lighting, and other important areas can be built into the system as it is put together. This means, that once the kit that produces the building are delivered to site, they can be fitted together quickly by the fully trained staff. The fact that the majority of the work has been carried out before the building is even delivered means that once the modular building arrives at your install location, the actual assembly can be carried out in a fraction of the time that it would take to build conventionally. Another advantage of modular building construction is that if your needs change over the lifetime of the building, changes can be made very simply. In order to add more space, you can add additional rooms or even a second story to the fully flexible construction model, while internal space can be changed with ease so that any combination of room divisions is possible within the normal shape of the building, and thanks to the latest designs, removing and replacing walls does not affect the surrounding panels, and can be carried out very quickly by the installers. Thanks to the latest techniques of modular building construction from Easy Rack, you will be able to enjoy world class office space that is flexible enough to grow with your business, and cost effective enough to make it a good investment that will assist with the way you work. In the past, one of the main criticisms that was leveled at modular buildings was that the interiors were inferior to more traditional systems, providing a lower quality of accommodation than the alternatives. With the new techniques and materials that are now used in modular building construction, you can rely on getting high quality office and meeting space within your existing buildings without any concerns about the interior, which will be fitted out to a professional standard thanks to painted surfaces, and well made panels that reflect the quality of construction. 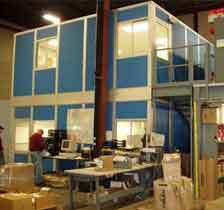 Of course, the biggest advantage of choosing modular buildings as additional space is that the construction process is entirely clean and will not interfere with other ongoing projects. Our installation team will simply be able to build the new space up from the supplied components, and as all the walls are supplied complete with no cutting needed, the only waste that the whole process will create is the packaging, which can be disposed of very easily. As soon as the buildings are finished, they are ready to use, and you can take advantage of them immediately rather than waiting for long periods of time. Easy Rack carries a wide variety of commercial shelving, material handling equipment, commercial lighting, used pallet racks, and modular prefab buildings installed nationwide. If you can not find what you are looking for call us toll free at 1-888-776-3720 and we will find it for you. Our home office is located in Houston, Texas with warehouses located throughout the United States that enable us to service all 50 states including Washington DC, Nashville-Davidson, Tennessee, Las Vegas, Nevada. Portland, Oregon, Oklahoma City, Oklahoma, Tucson, Arizona, Long Beach, California, Atlanta, Georgia, Fresno, California, Sacramento, CA, Corpus Christi, TX, Plano, Texas, Garland, TX, Laredo, Texas, Lubbock, TX.